School has started and I’m trying to wrap up my summer sewing here on the blog – while being predicatably overwhelmed the first week of school! So, let’s have a quick look at that same pair of olive trousers I posted in late August, shall we? 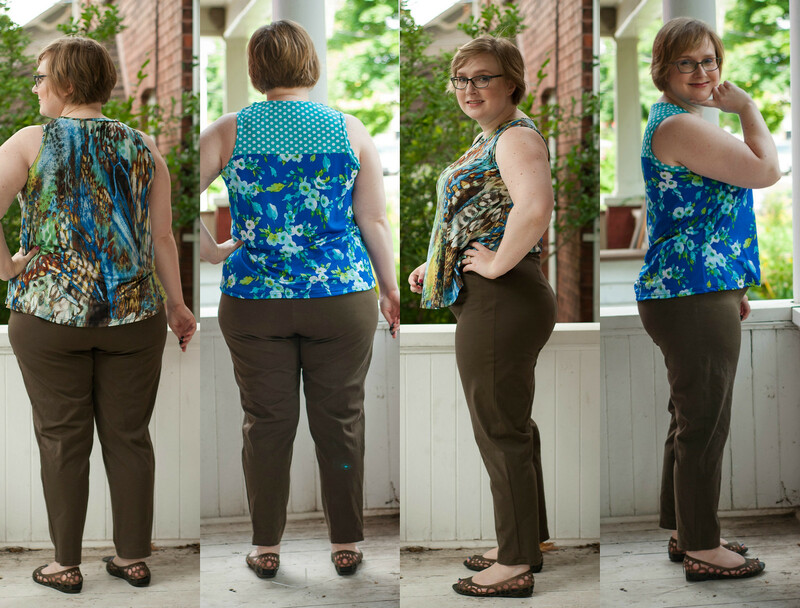 Pictures with green and brown tank show the original pants; the shots with the blue floral tank are after some crotch adjustments! As a reminder, these are the Closet Case Sasha trousers, with a straightened side seam. I’m aiming for a nice smooth fit with minimal wrinkles… but I’m also absolutely fine with wear these as is. That said, I’m game for easy improvements! In the past 6 years of making similar pants, I’ve tried all the classic adjustments: adding to the inner thigh, knock knee adjustments, full calf adjustment, and scooping the crotch. none of those touched the majority of my wrinkle problems, so i was looking for something new! After my first post, Dogwood Denim suggested that I have a low seat, and I need to angle the crotch down. I checked the shape of my crotch curve with tin foil, and I think she is absolutely right! 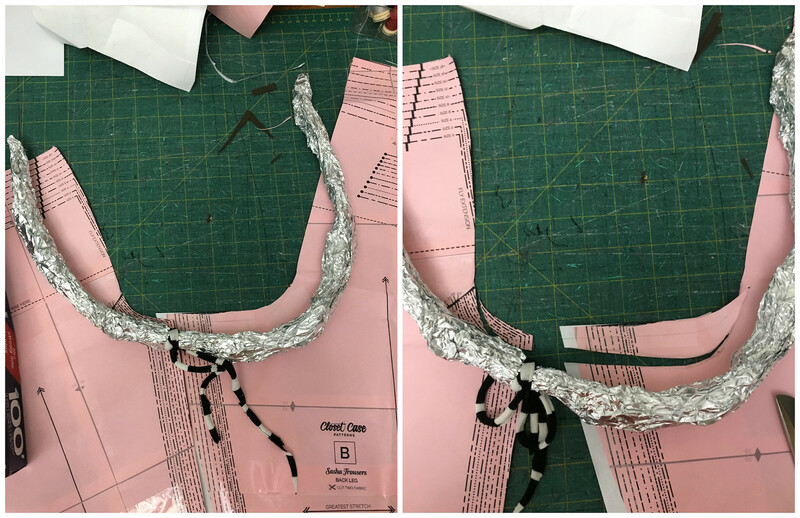 The striped black and white fabric marks the midpoint – can you see how after that my curve continues to angle downwards? … and let’s be honest, they look almost the same! They *feel* different though – the first time I pulled them on, I realised immediately that there was no tight seam trying to give me a wedgie! I’d never been aware of that feeling before, but I could tell when it changed. I think the wrinkles are slightly better in the blue-shirt pictures taken after the adjustments, but next time I sew this pattern I’ll make the adjustment even more deeply, and see how that goes! I’ll add some width to the upper thigh, too. In other news, I made a quick pair of blue Jenny shorts because the weather was so dang hot. In solid fabric it’s clear that I could take in the side seams a good inch to get rid of some extra fabric – I guess the leopard print on my last pair literally camouflaged that! Here’s the thing – I have a very short attention span with fitting. If clothes are wearable, comfy and cute, I will wear them. Everything I make could be slightly better, but once the garment leaves the sewing room, I just don’t care! So, if you’ve been thinking of making pants, or any other item with a reputation for being hard to fit… just make them! With that in mind, I’ve sewn my husband some very imperfect shorts and pants recently, and he likes them better than RTW, so I’m thrilled! YES to “just make them anyway”. I know that even if I had wrinkles all over the place that if I make my own pants where the waistband and hips are the same as my ratio (I’m a waist-less wonder) instead of whatever RTW thinks that ratio should be I’ll be infinitely more comfortable…but I still struggle to motive myself to sew pants because they aren’t that much fun and take a lot of time. I need to though, my pants situation is dire. Yes to make them anyway! It’s been really good to finally get back to pants and shorts this year, even if the fitting process is a bit of a pain. I’m glad you found an adjustment that works well for you! 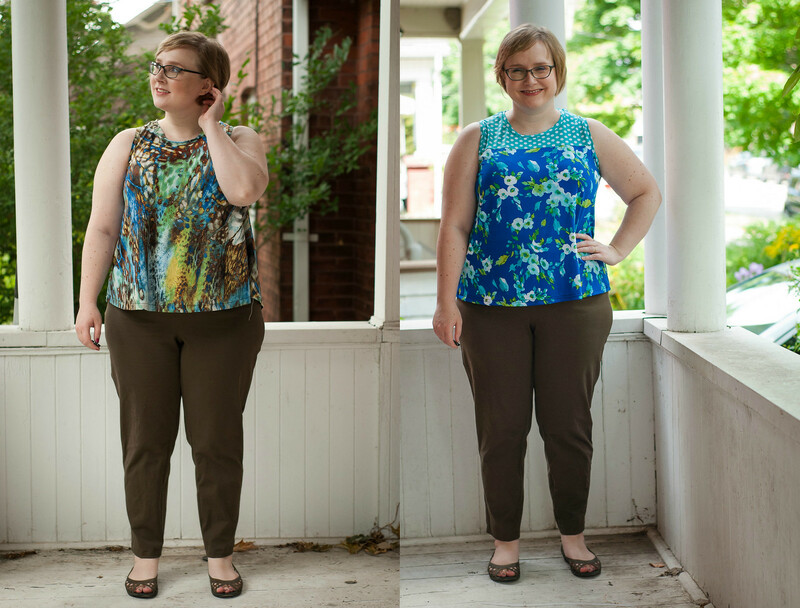 I think you’ve accomplished a great fitting pair of pants in your olive Sasha trousers! I love them 🙂 I’m taking a class with Alexandra Morgan next month here in Victoria on making your pants block which I’m super excited about – I’ve been determined to get busy making my own pants for a couple of years. I’ve made some knit leggings with success but those stretch wovens are a completely different beast. Oh, that is so interesting about the slope of the crotch continuing downwards at the back. I feel much the same about fitting. I have wrinkles in the backs of my pants, but I don’t stress about it. At least not yet, LOL…I never know when/if social media will alter my thoughts. They look really good. I have a few tnt pant patterns but I sill don’t enjoy making pants. Unfortunately they are a must have for me! I figure that as long as the garment fits me better than RTW, I’m wearing it!!! It doesn’t need to be perfect, just comfortable and as good as or better than RTW. I’d never seen the tin foil trick. Is there a video or link to that? Ingenious! What pattern did you use for your cute floral blue top. I love it! I love it that you could feel the positive difference with your alterations! After all our clothes should be comfy! So interesting to see you adjusting parts of garments to fit. No-one is a standard pattern shape or size. I struggle to make clothes occasionally and, like you, if it’s comfy I tend to wear it anyway. I recently had a mini measuring session with a sewing friend and parts of me didn’t fit any chart in her books – she’s been sewing for years (is a sewing teacher too) and she was amazed I was such an odd shape (I laughed, rather than cried, some things like the length of my neck I just can’t change!) At least it made sense of the disasters over the years.